During his three-decade career, Professor Barber has been examining sea ice, climate change and physical-biological coupling in the Arctic marine system. He leads the Circumpolar Flaw Lead (CFL) system study, an ongoing project which began during the recent International Polar Year (IPY) 2007-2008 examining how physical changes such as rising temperatures and sea ice melt in the Arctic affect biological processes within flaw leads (areas of open water between pack ice and land fast ice). What's the current state of sea ice in the Arctic? We found that the minimum sea ice extent that occurred at the end of summer 2010 was the third lowest on record. This is basically continuing with the same trend we’ve been seeing over the instrumental record that we have over the past 30 years, so no real surprises. We’re still moving towards this period where we’re seeing much less multiyear sea ice in the High Arctic and a lot more first-year sea ice. This will have major consequences on marine ecosystems and coupling between coastal and marine environments. It will also change how shipping and natural resource industries operate in the Arctic, opening it up for more development activity. What’s the current situation with multi-year ice? Has any of it recovered since the major melt of 2007? What happened in 2007 was that we had the minimum recorded sea ice extent in the Arctic on record that year. Then we had a slight recovery in ice extent in 2008, 2009 and 2010. But the recovery hasn’t been in multiyear sea ice. The slight recovery in the total extent of the sea ice just means there’s more first year sea ice that survives in a particular year. The old, thick multiyear sea ice that we used to have in the High Arctic all throughout the Arctic Basin has been declining since 2007. Just to give you an idea, when I began my career in 1981, about 80% of the Arctic Basin was covered with thick, multiyear sea ice more than five years old. As of 2009, only 18% of the Arctic Basin was covered with multiyear sea ice. We’ve been doing quite a bit of research on what’s causing that, and why we’re seeing such a dramatic drop in the amount of the perennial ice and the replacement of that with annual ice, so we’ve got a pretty good understanding now of what’s going on and what’s causing these changes to occur. You've mentioned in some of your presentations that satellites had mistaken “rotten ice” – chunks of multiyear sea ice stuck together by thin layers of first-year ice – for thick, multiyear ice. Have these satellite data been revisited? No. We’re still in the process trying to figure out how to get the satellites to detect this kind of ice because it’s electromagnetically so similar to multiyear sea ice. We’re still working on how to train the satellites to be able to detect “rotten ice”. There are a lot of challenges to doing this due to the way microwaves interact with sea ice. We still don’t have a solution, but we do know that this “rotten ice” exists now. Now we’re starting to pay attention to how “rotten ice” evolves very late in the season and how much of it is left at the end of the year to start to populate the multiyear ice at the start of the next growth cycle. Is this “rotten ice” included in the 18% multiyear sea ice left in the Arctic you mentioned earlier? No, it doesn’t. The 18% estimate is based on different types of satellite data and models. There’s a group at the National Snow and Ice Data Center (NSIDC) in Boulder, Colorado that produced that estimate. The estimate doesn’t rely on microwave satellites because of this known flaw in the microwave signals. It’s based on using a model and an ice monitoring satellite that measures the freeboard of the sea ice above the water line. You've also mentioned that the Arctic has been losing about 70,000 km2 of sea ice per year over the past decade. Is this trend continuing or has it leveled off since the record summer sea ice melt of 2007? No, it’s continuing. That trend is actually the average over 30 years. If you look at that over the last three decades – the ‘80s to the ‘90s, the ‘90s to the ‘00s and the ‘00s to ‘10s – the extent of sea ice during the summer was least variable from the ‘80s to the ‘90s, and it was more variable from the ‘90s to the ‘00s. During this period there was no detectable statistical trend either down or up. The majority of the downward trend has happened in the past ten years, and that trend is accelerating. That’s really the take-home message. We’ve been observing this over the last 30 years, with the instrumental record that we have – the variability in the minimum extent of ice has been going up and the trend towards less ice aerial coverage in the summer has been increasing, particularly over the last ten years. Have there been any estimates of the decrease in the volume of Arctic sea ice? That’s a really tough one. Volume is something up until just very recently we’ve had to estimate using models. We can also measure thickness using sonar observations from either moorings that are on the ocean floor or from submarines. But they’re very point specific. It’s difficult to get a good estimate of ice all over the Arctic because you just can’t physically get enough samples to tell you what that thickness is. Just recently – as in the last couple of years – we’ve started to have a couple of satellites (such as Cryosat-2) that are able to estimate what the thickness of the ice is. 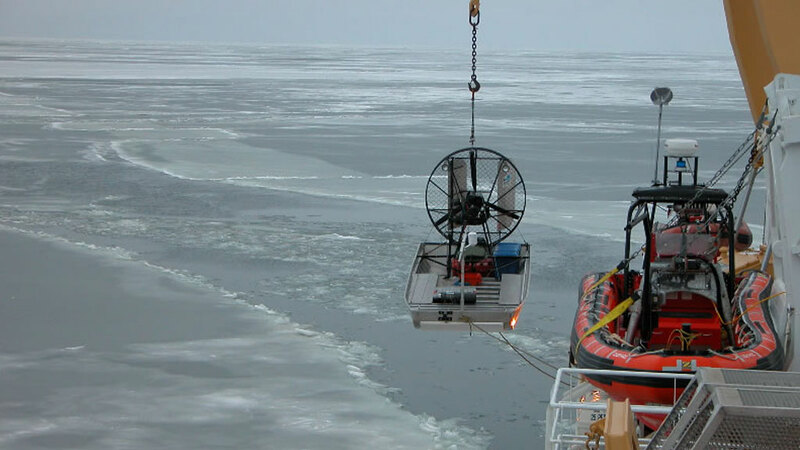 They work either an optical laser system or on a microwave laser system; they essentially measure the displacement of the ice above the freeboard of the ocean. The thicker the ice is, the more it floats, so you can estimate how thick the ice is by knowing how far the top of the ice is from the level of the ocean. That kind of research is still in its infancy, but I would expect that in the next two to three years there will start to be broader estimates of the volume of ice and the aerial extent of ice. We do know that we’re losing sea ice volume because we know that we’re losing multiyear ice, which is much thicker than first year ice. But we don’t know all the details just yet. There have been predictions that there will be more open areas of ocean in the Arctic and that this will lead to more low pressure systems and storms in the Arctic. Could you explain why? Thirty years ago, the Arctic Ocean would freeze up into a fairly continuous ice cover that remained mobile throughout the year. There would be a few openings in the ice cover called polynas or leads. They recur because of different kinds of ocean currents or atmospheric forcing of the ocean surface. We’ve been noticing more recently that these polyna areas have been opening up earlier and larger than they did before. We’re also finding that there are openings now that never occurred before that are occurring now because of the retreating sea ice. These areas provide an interesting glimpse into what the future of the Arctic will look like because they’re areas that are already open early and stay open longer. They mimic conditions we expect to find in the future. There are already a number of research groups around the world that study these features as an analogue of what the future will hold. From a climate perspective, these open areas are interesting because in the very simplest sense, they have a much lower albedo than the sea ice. When you have ice cover, the surface is highly reflective, reflecting most radiation back to space. When you have open ocean, the albedo drops significantly and shortwave energy is absorbed by the ocean. When this energy gets into the ocean, it has to go somewhere. It moves around, it affects the bottom melt of other sea ice, and provoke a number of other feedbacks in the system. When you talk about the atmosphere, these areas of open ocean tend to attract storms because they’re a source of energy, and that energy is being drawn out of the ocean into the atmosphere. We’ve found from our field programs in the Arctic in the very late fall that these over these flaw lead and polynyas attract storms that would normally head further south over the North American continent. They also stir up the ocean because they have a lot of wind associated with them, which limits the ability of the ice to start to form, because it inhibits initial ice crystal growth, which would then lead to more ice growth. Another thing these storms do is bring snow with them. This snow is deposited on the ice. So if there’s ice already there, the snow will fall on it. The snow acts as an ice insulating blanket, which doesn’t allow the ice to grow as much as it would otherwise. In the first year sea ice areas where the ice hasn’t been able to form yet, the snow just falls into the ocean. So these are the complexities of the feedbacks that go on in the system. We’re actively studying them to try and understand how they work – with the thought of being able to include these in models in the future, because ultimately we want to be able to model the processes to get a better understanding about getting good, precise predictions about what the ice going to do in the future. Speaking of models, you've stated that there are some models predicting that the Arctic Ocean to be free of ice during the summer by 2015. Are these predictions coming true in your opinion? There are a number of different estimates. The estimates of 2015 come from Wiesław Maslowski at the Naval Postgraduate School in Monterey, California, who’s been using models to study these things. The upper range of those estimates are somewhere around 2050, which means his models predict a seasonally ice free Arctic somewhere between 2015 and 2050. More importantly, you have to think about the definition of what a seasonally ice free Arctic is. If you’re interested in shipping, for instance, then your definition of a seasonally ice-free Arctic is you can use an ice-reinforced vessel or a fairly regular grade icebreaker to travel across the North Pole. In this sense, then a seasonally ice-free Arctic has already occurred, because the multi-year sea ice that we have in the Arctic – or what’s left of it – is all up against the Canadian Archipelago coast. The example I gave in Oslo was with our research icebreaker, which is a middle-of-the-road level icebreaker. We could do full speed through this kind of stuff like it wasn’t there. So it’s practically like being in open water. So you could use the argument that we already have a seasonally ice-free Arctic from the perspective of shipping, and this kind of thing is going to continue for a while. We’re going to have bits and pieces of areas that have ice, and the recirculation of ice and we’re going to continue to move towards a period where there will no longer be an ice barrier in the Arctic, and I would argue that we’re almost to that point already. And we’ll continue on through that period to a point where there’s blue ocean in the Arctic Basin where a vessel with no ice capabilities at all can travel through the Arctic. But it is important to remember that so long as we have seasons, we’ll always have sea ice in the Northern Hemisphere in winter. The only difference is that the Arctic will be dominated by annual forms of sea ice and not by multiyear forms of sea ice, and we’ve been moving very quickly towards that kind of scenario since the minimum extent occurred in 2007. You’ve also said that it has been at least a million years since the last time the Arctic was seasonally ice free. There are different estimates for this depending on how you look at it. It’s been a very long time since the Arctic has had no ice in it at all, when it was just open blue ocean. We can estimate when in the paleoclimate record we last had an ice free Arctic by taking sediment cores from the ocean floor and looking at the distribution of organisms that have precipitated over time. You can find periods where the ecosystem has shifted from an ice-dominated one to a blue ocean-dominated one. You have to go back a very long way in time to find a blue ocean-dominated sediment core record in the Arctic Ocean. So on a geologic timescale, the changes we’re seeing in the Arctic are happening very quickly. Exactly how it’s going to unfold and at what rate it’s going to unfold – there’s still a lot of uncertainty associated with that. There have been unusually cold temperatures in the mid-latitudes of the Northern Hemisphere during the winters of 2009-10 and 2010-11, especially in North America. This has led many to conclude that climate change might not be happening. What’s been the situation in the Arctic? The Arctic has been warm. The Western High Arctic was particularly warm this year, as was the Siberian Arctic. I was in Nuuk in Greenland in January. They have no sea ice and no snow, which is very unusual for Greenland. So that sector of the Arctic is also very warm. The variability that we’re seeing around the planet surface – part of it is a natural byproduct of the climate system, being a complex system you get large variability form place to place, and there are large teleconnections that drive a lot of that. In Canada it’s cold like I remember it being cold when I was a kid. We’ve got many -30°C days, lots of snow – what I would consider to be a traditional winter in Canada. But that’s because we’re in a La Niña year, which causes circulation patterns to bring cold air down over continental North America, and it makes what you would think of as cold, but it’s not really any colder than it used to be when we were kids. It’s very difficult to explain to the lay public that it’s variability and the fact that one part of the planet is warmer and the other part is colder. When you look at models of climate change, we expect a few things to happen: One of them is we expect an increase in variability in the hydrological cycle, which we’re seeing all around the planet – with Russia having record droughts last year and Australia having record floods this year. And in North America it’s the same. From year to year we see an increased intensity in the hydrological cycle. We also expect to see an increased variability in temperature, which means we expect the highs to be higher and the lows to be lower, and lots of variability away from a trend. And that is also happening around the planet. A third thing that we expect is a reduction in the amount of ice in the high latitudes; this is happening with the reduction in glacial mass balance as well as aerial extent and thickness of sea ice. So all of these things are still pointing in the direction that we would expect them to point. But it’s a complex system and people have a hard time thinking beyond their backyard. Does this have to do with the fact that people often confuse climate and weather? Yes, that’s one of the problems. And you can’t describe any particular individual event as a climate phenomenon; it’s a weather phenomenon. It’s what you see out your window; it’s not what you expect to see out your window. It’s a complicated idea and people have a difficult time understanding that. David Barber is a sea ice specialist and Professor of Environment and Geography and Canada Research Chair in Arctic System Science at the Centre for Earth Observation Science (CEOS) at the University of Manitoba in Winnipeg.